Yo Digital Marketers! 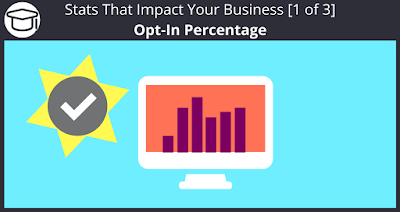 Let’s talk about your Opt-in Percentage. These basic stats are the foundation of building and understanding your subscriber lists. Keep a close eye on these while continuously trying to improve them and you will go far in the email marketing world. Seriously people, if you aren’t trying to grow, then you are dying. One of my favorite statistic quotes is… (although it’s taken out of context, it works here). Many digital marketers find around 30% Opt- in rate as acceptable. Most shoot for that ever coveted 50% to really maximize their traffic. Of course, seasoned marketers can see even higher rates as they fine tune their page and traffic sources. Keep in mind there are an array of factors that will contribute to your opt-in rates. The Landing Page – Are your reasons for visitors to opt-in good and compelling? Does what you are offering for their email address speak to the wants, needs, and pains of the visitors arriving at your squeeze page? Here is an example: “Subscribe to my list for a free recipe of the best way to make liver and onions.” Now, if I saw that, I would report you to the internet police for trying to kill me! Make sure what you offer is what people really want. Traffic Quality – This will highly impact not only the amount of visitors that opt-in to your list, but will also affect the interaction of stats in your future mailings. Specifically, open rates and click rates. We have seen our users purchase very cheap clicks before, and they may get around a 3% opt-in rate. Whereas other users who purchase higher quality traffic can see a 60% opt in rate on the same landing page. For example I saw a user purchase 5000 clicks for $5 from a website… let’s call Sixerr.com. The clicks were delivered and the opt-in rate was a big fat zero!! No opt-in = no sales. The Bait – This is perhaps on of the most overlooked factors that contribute to your opt-in rate. Whether it’s a PDF, digital audio & video, or some kind of coupon, it needs to be of value. Not just to you, but to the type of visitor that stumble across your landing page. Just because you found value in a great way to make liver and onions doesn’t mean everyone will. Again I’ll report you to the “internet police”. In the end, you want your landing page to convey exactly what your offering with a compelling offer. Then you should flood it with high quality traffic to see the best results. What’s been your experience using bait? Share the love, and leave a comment on some of the best bait you’ve used.